This low bowl filled with living plants will also carry comfort and compassion for many months to come. Perfect to send to the home or service. 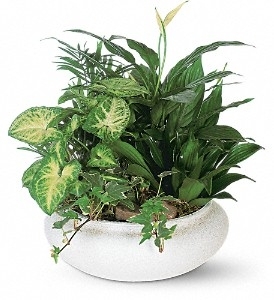 One planter arrives filled with dracaena, ivy, palm, spathiphyllum and syngonium plants. Substitutions may be made depending on seasonal availability.